Pablo Neruda was a poet and a politician, a Communist senator who was forced to go on the run when the Chilean president banned the party, despite having helped to elect him to power after the Second World War. 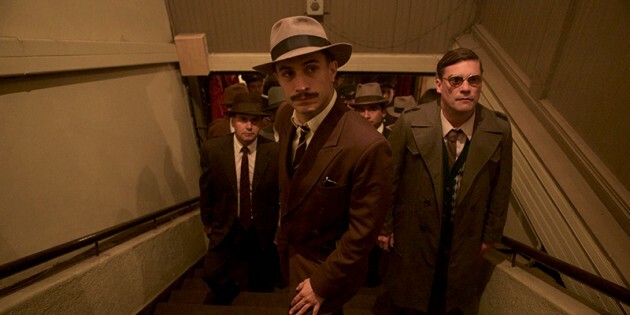 With 300 police deployed for his capture, headed by the laughable Prefect Peluchonneau (Gael Garcia Bernal), Neruda (Luis Gnecco) becomes fixated on this pursuit and longs for it to be a great ‘wild hunt’. Pablo Larraín’s Neruda can be paired with his recent American debut Jackie: both focusing on a singular historical event and the fallout there surrounding. Where they differ is that Jackie appears painstakingly researched and replicated on screen, where Neruda employs artistic licence to blur the line between fact and fiction, doing so with tongue in cheek. Where Jackie is austere and solemn, Neruda is knowing and playful. Following the poet’s fondness for pulp detective novels, the film takes on the look and feel of a noir cat-and-mouse chase. In this way it seems Neruda is taking charge of his own story. Adopting the lyricism of its subject, the film gifts itself an ability to constantly reframe scenes with a taste for the theatrical. Conversations between characters will suddenly be transported to a different location with a different angle and dramatic lighting cues, with silhouettes and voice-over reinforcing the style. Neruda‘s artificiality doesn’t detract from it’s beauty, it frames it with intention. In it’s simple little flourishes it is humorous, peculiar and utterly cinematic.